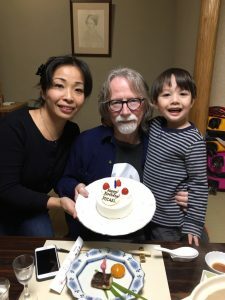 Although it was two days before, we continue to celebrate my birthday. 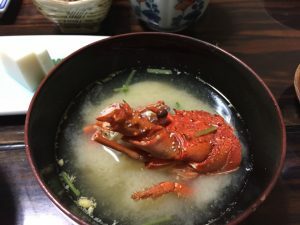 We had a crazy wonderful breakfast including tamago (egg) and lobster miso soup! There was also fish, rice, and different kinds of pickles – NOT your typical American food but sooo delicious. 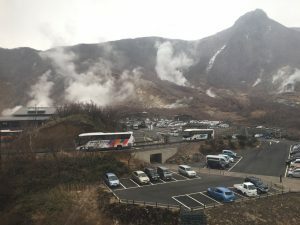 The bus ride to get to Hakone took us up and over the local mountains and as we crossed over the top, it began to snow! I wish I had been able to get out and take some photos because it was stunningly beautiful. 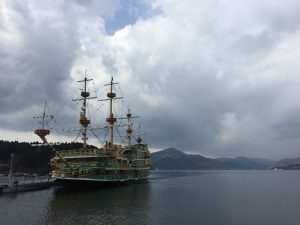 Hakone is a tiny little town located on the shores of Lake Asahi. 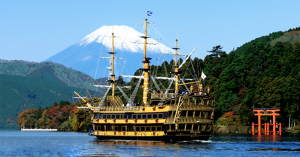 The lake is tucked into the Southeast corner of a huge volcanic caldera and on a clear day you can see Mt Fuji. 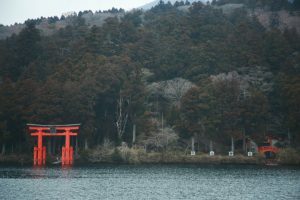 Although we didn’t have time to go there, Hakone Shrine is also located on the lake and is indicated by a beautiful large red Tori Gate. In Hakone we visited the wood working shops and all the tourist spots where you can buy lovely gifts that are unique to this area. We boarded a large “ship” and toured around the lake and enjoyed being able to sit down for a little while and get out of the cold, the wind, and the snow. There is a cable car called the “Ropeway”, that goes to the top of the mountain. It is sporadically open because the volcano frequently belches out poisonous fumes that stop the cable car operations. When we got there, it was closed. We were buying gifts in a local shot when all of a sudden they announced the Ropeway was open! We dashed to the station and hopped on and rode to the top of the mountain to where the volcano was still spewing out sulfur clouds. 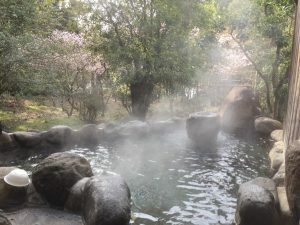 There are hot springs all over this area and one tradition is to put eggs in the sulfurous springs to hard boil them. 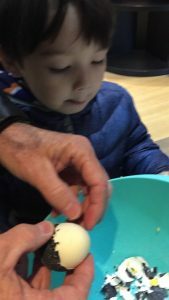 This process turns the egg shells black and eating one is supposed to add 7 years to your life! So I had about a dozen. A slight bit of the snow had begun to stick to the ground so I showed Squi how to make a snowball! He, unfortunately, picked Mommy as his first target. She was lucky he didn’t have gloves, so after three snowballs he was done making them. From the top of the mountain, we took a bus down to Sounzan and and from there a small train to Gora. We were having a nice lunch in Gora and waiting to board yet another train, when I realized I had left my cell phone on the bus! 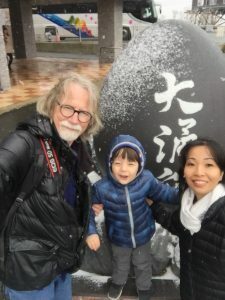 In any other country, kiss it goodbye, but in Japan it is a matter of just going back to get it. No one steals in this country and everyone makes their best effort to get whatever you lost, back to you. We were running out of time, but managed to dash back up the mountain and retrieve my phone. Back down the mountain we boarded a quaint old train and rode slowly to Odawara, then back “home” to Yugawara station. 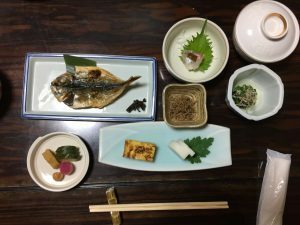 From there a short taxi ride back to our ryokan Kamata. We were fairly tired from being out in the cold, wind, and snow but it was all so fun, except for losing my phone, and we came back with gifts for friends and great memories. 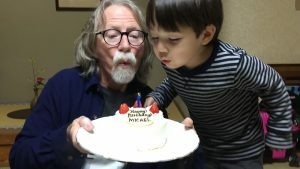 That evening, after yet another fabulous meal, Squi helped me blow out the one candle on my surprise birthday cake. A nice way to end a day and relax in comfort.